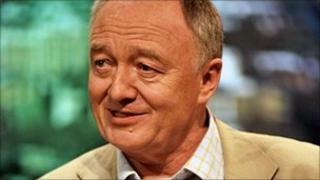 London mayoral candidate Ken Livingstone has compared his battle to regain City Hall from Boris Johnson with the "great struggle between Churchill and Hitler". Mr Livingstone's comments feature in Total Politics magazine. Croydon Tory MP Gavin Barwell said: "Comparing rival politicians to Hitler is in incredibly poor taste." But Mr Livingstone's aides said his comments were "light-hearted". City Hall declined to comment. In comments, reported in the latest issue of the magazine, the former London Labour mayor said next year's mayoral race was "a simple choice between good and evil - I don't think it's been so clear since the great struggle between Churchill and Hitler." "The people that don't vote for me will be weighed in the balance, come Judgment Day," he continued. "The Archangel Gabriel will say 'You didn't vote for Ken Livingstone in 2012. "Oh dear, burn forever. Your skin flayed for all eternity.'" Mr Livingstone added he would "come round with a serious pitch nearer the time". However, Mr Barwell, MP for Croydon Central, said: "After the events of the last week, Londoners need a mayor who will unite our city, not one who regards people who don't share his views, as evil. "To joke that Londoners who don't vote for him will 'burn forever' after everything we have been through in the past two weeks is crass even by Ken Livingstone's standards."